Donate today, help kids all year long. Ensure our Los Gatos schools remain top-rated. Los Gatos has world-class schools because of generous support from our parents and community. Your tax-deductible donation funds supplemental teachers and staff that ensure every Los Gatos student gets the high quality education they deserve. ​But hurry! This matching grant ends on November 20, 2018. We suggest a donation of $800 per child (or $70/month). Other districts ask for $1,000 per child or more. Click here for a comparison. Consider giving at a higher level if practical. Have more impact and be recognized as a major contributor. Your gift at any level is encouraged and welcome. Each family should give what is meaningful to them. Every donation makes a difference and all are appreciated. Why is $800 the suggested amount? The matching grant is an employee benefit that costs you nothing except a few minutes of your time. With these few minutes your generous donation can as much as double in supporting our kids and their education. Click here to see if your employer matches. Donate Stock. Plenty of families choose to donate stock. In addition to helping our students it comes with nifty tax benefits for the donors. Become a Business Partner. Each year our business partners provide critical support needed to help us reach our goal. We work hard to feature our business partners, to promote their contribution, and to provide every benefit we can to thank them for their generosity. Shop AmazonSmile. Select us as your charity at AmazonSmile and Amazon will donate 0.5% of your eligable purchases to LGEF. Volunteer. We need you! 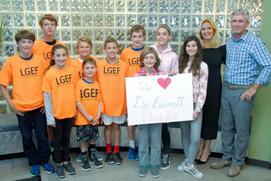 Help inform parents and local businesses about LGEF and the educational programs we fund.